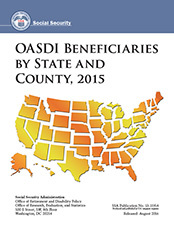 This annual publication focuses on the Social Security beneficiary population—people receiving Old-Age, Survivors, and Disability Insurance (OASDI) benefits—at the local level. It presents basic program data on the number and type of beneficiaries and the amount of benefits paid in each state and county. It also shows the numbers of men and women aged 65 or older receiving benefits. This report is a useful planning aid for Social Security Administration field offices and for those providing information to federal, state, and local government agencies. State data on beneficiaries as a percentage of the total resident population and of the population aged 65 or older are shown in Table 1. State data on the number of beneficiaries with benefits in current-payment status and the amount of those benefits are shown in Tables 2 and 3, respectively; the comparable data, by county, are shown in Tables 4 and 5. The data include only persons whose benefits are currently payable. Those whose benefits were withheld are excluded. The data in this report are derived from the Master Beneficiary Record, the principal administrative file of Social Security beneficiaries. The national ZIP + 4 file produced by the U.S. Postal Service is used to designate the beneficiary's state and county. The ZIP + 4 file, which specifies counties in terms of 9-digit ZIP Codes, provides a more accurate designation of counties where ZIP Code areas cross county boundaries than the data available in the Master Beneficiary Record. The monthly benefit reported is the amount Social Security beneficiaries were paid for the month of December. The monthly benefit is the amount payable after any reductions. Some Social Security beneficiaries have a representative payee—a person designated by the Social Security Administration to receive their monthly benefit when such action is in the beneficiary's best interest. About 3 percent of all adult beneficiaries and virtually all child beneficiaries under age 18 have representative payees. For most children, the representative payee is the parent with whom the child resides. For beneficiaries with representative payees, the state and county designations are those of the representative payees, not those of the beneficiaries. If the number is evenly divisible by 5 (ends in 0 or 5), then the numbers are not changed. Otherwise, the number is rounded either to the next higher multiple of 5 or the next lower multiple of 5, in such a way that the difference between each rounded and unrounded cell value, each rounded and unrounded row total, and each rounded and unrounded column total is less than 5. After the numbers in Table 4 have been rounded, the dollar amounts in Table 5 are proportionately adjusted upward or downward, as appropriate. The totals in Tables 4 and 5 are true totals. Contains all the counties and independent cities in one tab for each table without state-level subtotals, and includes D.C. and all outlying areas.